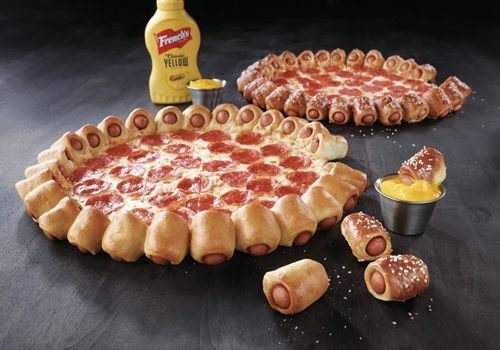 Here's my question: Why doesn't Pizza Hut just sell the pigs in a blanket (aka "hot dog bites") separately? That's basically all that's going on here, except now the pizza is harder to pick up because there's no crust left after you eat the mini hot dogs. And even if you save that part for last, it looks pretty wobbly and annoying to hold compared to a much sturdier regular crust. While I'm on the subject, I think the Little Caesars' bacon wrapped crust is a great idea. People often leave their pizza crust behind, or eat it disappointingly after the rest is gone. But in this case, it has the awesome taste of bacon to keep you interested.